Country Child has always been a fan of fishing and recently chatted to local fisherman Simon Cooper about how he became a fly fisher and river keeper from a young age, and who is also now the author of The Otters' Tale book and offering fishing breaks for families and children. My introduction to fly fishing began with a chance conversation hanging over a farm gate. Actually I wasn’t doing the talking. As a lanky 12-year-old I knew my place in the natural order of things and it was my father who was idly chatting away for what seemed like forever with our neighbouring farmer. It is a strange thing but rural conservations of that sort are rarely done face-to-face, rather side by side, both parties staring fixedly at the subject in question. That day, the subject was the water meadows our neighbour had just bought. I must have cycled, walked or been driven past them a hundred times in my short life but that day was the first time I’d ever given them any consideration. In the spring breeze, a cacophony of wild flowers, all pale yellows, blues and flecks of white, filled the acres, gently sloping downwards to a green snaking ribbon, within which I spied the sparkling river. Slipping under the fence I left the conversationalists behind, following the cattle-trod path towards my destination. Of course I’d seen the river before but that day it took on a new persona as I explored along the banks. The clarity of the water; the gurgling, slurping noises it emitted as the current negotiated its journey downstream; the tiny insects dancing above the surface; the furry, confident water voles going about their daily lives. And fish. I’m sure I’d spotted trout before, but that was the first time I’d ever truly wanted to catch one. A shout told me I was required back at the gate. As I reached our leaning pair the farmer asked, ‘Do you like to fish?’ Without any hesitation, and regardless of the fact that I had never held a rod or cast a line, I knew the answer I had to give: ‘Yes’, I replied. ‘In that case, help yourself.’ My father seemed unperturbed by my blatant lie. I expected at least some sort of chastisement but as we headed for home, he turned to me with an odd smile: ‘Well, I suppose we’d better buy you a fishing rod.’ Maybe he’d seen a spark in me that should not be extinguished. And so my fishing career began. I cannot pretend my transition from enthusiastic novice to half-competent professional was seamless. There have been some bad days. The start of my first day on the river with the rod my father had bought me looked a bit like that at the outset. I was stung by nettles, cut myself on bramble barbs and filled my wellingtons with water. I was closer to tears than piscatorial success, until by sheer fluke I caught a trout. To this day it remains one of the happiest moments of my life. But it wasn’t just the fishing that brought me joy. I spent my adolescent summers on that river. To misquote Ratty from Wind in the Willows, ‘Believe me, my young friend, there is nothing – absolutely nothing – half so much worth doing as simply messing about in [rivers].’ I cut the weed; trimmed the banks and repaired the fences. I lived with the trout and tried to understand a life underwater. I was, in all certainty, the youngest and most incompetent river keeper in Hampshire as I tried to tame that section of river and I spent far, far too much time there. But the arid biology and botany of the classroom suddenly made some sort of sense (though I am not sure it did much for my grades), and one thing is for sure: all these years later I am very glad that on that day I said yes rather than no. FISHING FOR CHILDREN - 25% for Country Child Readers! 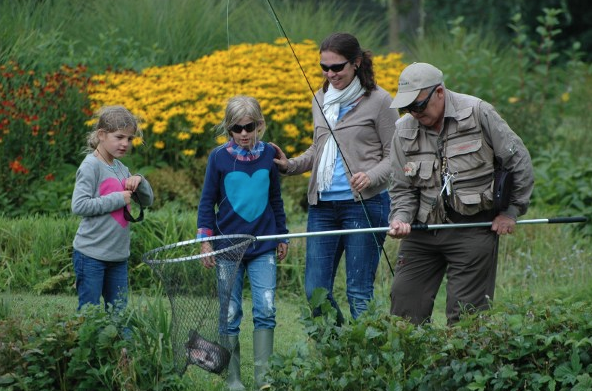 Simon Cooper runs a programme of summer fish camps for children from 8–16 years of age. 3-day River Camp For children aged 11–16. Three days on the river, learning everything there is to know about fishing and life on the river. July 17–19. £275. 25% discount for readers of Country Child. 5-day Fish Camp Four mornings and one full day at Nether Wallop Mill. Perfect for the budding fly fisher; expert instruction and tackle provided. July 24–28. £250. 25% discount for readers of Country Child.